Now using the best beads available on the market - guaranteed! We have recently revamped the product line and formed a relationship with the premier bead manufacturer. These are more reliable and durable than others out there and we guarantee it. These are hard silica beads preconditioned to maintain a humidity level of 65% and capable of supporting approximately 160 cigars. They are ideal for aging and maintaining your cigars, whether they are stored in a humidor, Tupperware, coolidor or other creative system. These humidification beads are a moisture sensitive 2-way system that both absorb humidity and release it automatically as necessary to maintain a perfect environment for your cigars. Unlike older style gel humidifiers, these will not expand and push their way through your humidifier, nor will they develop mold. Our silica beads are the same type of product that is used to protect the significant investments and priceless collections housed by fine art museums and collectors. Do not make the mistake of buying lesser quality beads that are not specifically designed to maintain a proper humidity level. You spent a lot on your cigar investment, so make sure you have the right protection! RHShieldTM will never "wear" out as long as they are properly maintained. Maintenance is as simple as adding distilled water when they dry out, or regenerating the beads if they become completely saturated. Normal silica beads are a natural desiccant where their main function is to absorb humidity in order to keep a product dry. Their use is intended for protecting products such as electronics, clothing, and food from humidity and mold. Therefore they are only intended to absorb humidity, not release any of it. 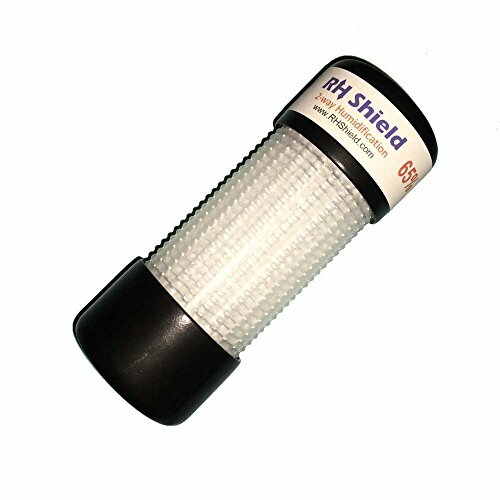 RHShieldTM is designed to both absorb humidity and release it in order to maintain an ideal relative humidity. If you have any questions about this product by RHShield, contact us by completing and submitting the form below. If you are looking for a specif part number, please include it with your message.